Here’s an interesting statistic. The earth contains more than one billion trillion litres of water. However, only three per cent of that is fresh water, and not all of that fresh water is available or healthy to drink. Another way to look at it is the bucket analogy—if we could put all the earth’s water into a 19-litre bucket, then just over one half litre of that water would represent all the fresh water in the world. One half cup would represent all the available fresh water—water not locked into existing glaciers—and of that, only one drop would represent uncontaminated, fit to drink water. According to the United Nations, that figurative half cup of fresh water should be enough to comfortably support seven billion people. Unfortunately, too much of our fresh water is unevenly distributed, wasted, polluted or unsustainably managed. By the year 2025 it is estimated that 1.8 billion people will experience absolute water scarcity and most of the world’s people will be living under water-stressed conditions. Those are shocking statistics, especially when you realize that 2025 is only nine years away. Clearly, our drinking water is a precious resource that needs to be protected and conserved. 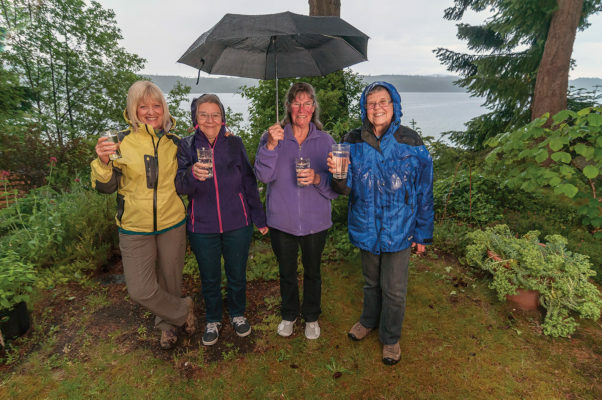 Linda Safford is a member of the Comox Valley Water Watch Coalition, a grassroots group founded in 2006 as part of an Island-wide effort to educate the public and create meaningful policy that will eventually protect our drinking water. Our precious and beautiful Comox Valley watershed serves 45,000 individuals and is comprised of Comox Lake and its tributaries, including much of the Puntledge River. Comox Lake is large, with a surface area of 2,100 hectares and a maximum depth of 109 metres. The watershed as a whole is approximately 58,000 hectares. Seems big, but don’t let the size of our watershed fool you. For one thing, the Comox Valley Regional District, who manages the removal, treatment and distribution of our water, has a limit to how much of that visible water they can remove—both daily limits and annual limits. All water in British Columbia is vested in the Crown, and to divert and use surface water one must receive a licence or approval to do so—and the applications are not always granted. For example, in June 2013 the CVRD requested an increase to their existing water licence to draw additional water from the river to support projected population growth over the next 25 years. For various reasons, their request was denied. Secondly, the water that flows from Comox Lake is shared between three primary users—the CVRD, BC Hydro, for energy generation purposes, and the Department of Fisheries and Oceans. BC Hydro is the master licence holder for the lake’s water, and as such, manages the flow rate to ensure the protection of fish habitats. Normally the minimum river flow to ensure fish survive and thrive is 15.6 cubic metres a second. However, over the past two summers, BC Hydro has received permit variances that allow them to drop the river flow to 8.5 and 7.5 cubic meters per second. This happened because the inflow of water to the lake was incredibly low—the lowest seen in many years. As a result, BC Hydro had to restrict outflow to maintain a lake level that would facilitate drawing water for public use. When we look at Comox Lake, we are only seeing a tiny portion of what creates our watershed. Groundwater, located in aquifers, is actually the hidden source behind the visible surface water. Rainwater infiltrates the subsoil and replenishes groundwater supplies. Some water flows into streams and rivers and becomes runoff. Threats to the groundwater are climate change that results in hotter, more arid conditions, preventing the infiltration of rainwater to the aquifers, and conditions that create more runoff, such as the destruction of watershed timberlands. The surface water of our watershed is also affected by many outside influences, such as timber harvesting, power generation, residential and recreation use, as well as natural erosion and wildlife. All of these things have the potential to negatively affect the water quality of our sensitive watershed. Our watershed is also complicated. Unlike Vancouver and Victoria who own their watershed, the CVRD does not own the land that comprises our watershed. Instead, ours is a multi-use watershed with nine different categories of landowners or responsible jurisdictions. In fact, the majority owner of our watershed is an active logging company, TimberWest, who owns approximately 60 per cent of our watershed. As you can imagine, since we don’t own the land that comprises our watershed, it’s difficult to control what happens there. In fact, no single agency or public authority manages our watershed. Instead, TimberWest and its logging practices are regulated by the Private Managed Forest Lands Act, which, according to the Comox Valley Land Trust, is not as strict as those that govern logging on public land. Though the CVRD does not own the land that surrounds our drinking water there are legislative bodies, such as the Ministry of Environment and Island Health, that work to protect it. For example, TimberWest is obligated to conduct their logging practices in conjunction with legislation such as the Private Managed Forest Land Act, the Federal Fisheries Act, the Fish Protection Act and the Drinking Water Protection Act. Unfortunately, Canada isn’t leading the way when it comes to protecting our tree cover. In fact, we are second only to Russia in annual tree loss. From 2011-2013 Canada lost 2,450,000 hectares of forest. This was mainly due to forest fires and deforestation from oil, gas and logging operations. This fact is relevant to a discussion of our watershed. If you look at a series of satellite images of the Comox Lake watershed from 1984 to the present, one can see the extent of logging that has occurred over the past 33 years. When we remove large stands of trees we create ground instability, and in doing so we also increase the amount of sediment that flows into streams and rivers. All this sediment flows into the lake and results in turbidity. Ah, the T word: turbidity. Comox Valley residents have heard this word a lot these past couple of years, as it is the reason for those costly and annoying boil water advisories. Turbidity is defined as fine suspended particles picked up by water as it flows through streams and rivers. The problem with these particles is that they can harbor pathogens, which have the potential to overload the disinfection processes. As well, organic matter in water can react with chlorine to create disinfection-by-products (DBPs) that can be detrimental to our health, especially over the long term. Though the issues that can arise with increased turbidity can negatively affect the health of anyone, those most at risk are the very young, the very old, or those with underlying health conditions. So it’s more than just cloudy water. Actually, measurable turbidity is not even visible to the naked eye—when the turbidity levels are above normal, the water from our taps may look the same as ever. But as the turbidity increases so do the health risks. Though Island Health requires filtration, there is a clause in the legislation that allows a deferral of the filtration system if the source is considered a quality source and the turbidity rate can be contained to stay below one NTU 95 per cent of the time and under five NTU 100 per cent of the time. (NTUs are Nephelometric Turbidity Units. Nephele is the Greek word for ‘cloud’; metric means ‘measure.’ Nephelometric, therefore, means ‘measuring cloudiness’.) Since Comox Lake is considered a quality source the CVRD was issued a deferral, and as a result the CVRD was able to provide drinking water with only one form of disinfection—chlorination. The problem is the deferral only stands as long as the situation remains constant. “Sometimes a filtration deferral will be given upon request, but that can always be revoked. For example, because of turbidity issues we were no longer able to show that we were able to meet the NTU requirements, and as a result, Island Health revoked the deferral,” says Herschmiller. “Now the operating permit issued by Island Health states that we must construct a filtration facility. We are required by law to follow the permit guidelines, and these guidelines are ones put forth by the Province as well as the federal government.”During the last few months the CVRD has been conducting internal and public meetings to decide the best route to take in our water filtration system. “We’ve carefully considered many options, and that consideration has included consultation with the public. In fact, the values and opinions collected at the public consultations were a large part of the decision making process,” Herschmiller adds. It’s interesting to note, though, that having a deep water intake alone will not solve our turbidity problems. That’s why the CVRD has decided to include filtration as part of the new treatment process. “Some people think that the deep water intake will solve our turbidity issues. It won’t,” says Herschmiller. “In fact, had we had the deep water intake, the 47 day water advisory event of last year would have lasted two additional weeks.” The new intake/filtration system is due to be completed in 2019. Climate change is one risk that we can see and measure. In fact, climate scientists are predicting that this coming summer will be another unseasonably warm season. Already changes are visible. For example, creeks that are normally still flowing at this time of year have already run dry—and it’s not even summer yet. Last year the Province issued a level four drought rating for all of Vancouver Island and the Gulf Islands. A level four is the highest rating possible and means an area’s water supply is no longer sufficient to meet the needs of the population or the ecosystem. This was the first time a level four drought rating had ever been declared. Climate change is also changing the way precipitation falls. “The last two years have seen unprecedented rainfall in a short amount of time,” says Herschmiller. “These intense bursts of rain wreck havoc.” Specifically, large rainfalls such as we’ve seen the last two winters cause damage to the creek beds and create massive amounts of turbidity in the lake. So we are looking at higher than average rainfall during the winter, yet hot and dry summers. It seems we have a new weather reality where abnormal is the new normal. Yet we are not used to such weather, so how do we respond? Whatever the response it is clear that conserving and protecting our water source is more important than ever. One way to conserve water is for individuals to become aware of exactly how much water they use. This is achievable by installing municipal water meters. The Village of Cumberland and the Regional District service area successfully installed water meters several years ago as a way to help the citizens conserve water, and it has been a success. As well, the town of Comox is making great progress installing voluntary residential meters. At this point approximately 50 to 60 per cent of Comox residences have been metered, and the early data is showing promising results. But water metering is a contentious issue. Many politicians and citizens get hot around the collar as soon as the topic is broached. As a result, British Columbia lags far behind the rest of Canada when it comes to water metering, with less than 40 per cent of homes using a water meter. Many opponents argue that the benefits are not enough to cover the substantial cost of installation. However most water experts agree that water metering, if there is an incentive to save money with less use, will lower household consumption by 30 to 50 per cent. The decision makers in charge of Courtenay are digging in their heels at the thought of installing actual meters. Instead, Courtenay is only installing meter setters at all new builds and major renovations. Installing the setters makes it easier to install actual meters in the future. Metering or no metering, there are steps we can take to conserve water. Some steps are simple and inexpensive to do, such as adhering to the watering restrictions, fixing leaky taps, and washing our cars with a bucket of water instead of a hose. Every day we need to ask ourselves if we as individuals are managing our precious resource responsibly. In the meantime, officials and volunteers are doing what they can to create meaningful strategies that can help us better manage our watershed. In fact, on April 12, 2016 the Comox Valley water committee adopted a binding document called the Comox Lake Watershed Protection Plan (WPP). The WPP contains 54 strategies that will be implemented over the next few years, all of which are necessary to protect our water—for ourselves and for future generations. Many of the steps are overarching and significant. For example, one strategy is the purchase of properties in the watershed if they become available. The WPP is due to be released to the public this summer and implementation will be part of the CVRD’s annual budgeting process. Those who work to protect and manage our unique watershed have their hands full. However, they are fully aware of the risks to our watershed, as well as the importance of clean drinking water. Every time we turn on the tap and clean water flows is a time to be grateful.